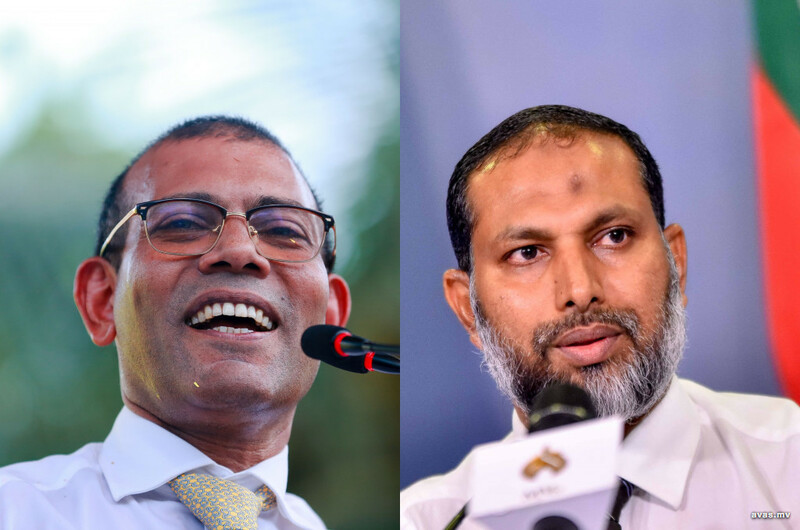 Adhaalath Party (AP) on Monday have declared that they are ready to give up some of their target constituencies for the parliamentary election in order to seek a solution to the current issues regarding the election faced by the ruling coalition. AP had previously announced and fielded candidates to contest 13 constituencies in the parliament elections slated for April. However, the party is now ready to give up some constituencies in the best interest of the nation. On Sunday night, AP conducted talks on allocating parliament seats with main ruling Maldivian Democratic Party (MDP), with AP leader Sheikh Imran Abdulla present at the meeting along with MDP leader and former president, Mohamed Nasheed. AP had proposed that both parties contest the election together. The national council of MDP will be making a decision on the proposition on Tuesday. According to reports, Adhaalath Party is ready to give up seven constituencies in order to ensure MDP backing for six Adhaalath candidates. The coalition parties had previously agreed to contest both the parliamentary election and the local council elections through the coalition in order to ensure maximum number of seats. MDP and coalition partner, Jumhooree Party (JP) have remained at loggerheads over contesting the upcoming parliamentary elections through the same coalition which saw them win the presidential elections in November last year. In an agreement signed between the coalition partners ahead of the presidential election last years, it was decided that MDP will contest for 35 seats while Jumhooree Party, Maumoon Reform Movement and Adaalath Party will contest for 22, 17 and 13 seats respectively. However, main ruling Maldivian Democratic Party (MDP) decided at its National Council to contest for all 87 constituencies in the parliamentary election, despite the existing coalition agreement to divide up the seats among themselves, triggering dispute among the coalition. The four leaders of the coalition have sat down several times with President Ibrahim Mohamed Solih in attempt to resolve the dispute. However, an agreement has not been reached thus far. Speaking to AVAS, head of Adhaalath Party's media committee, Ali Nazeer on Monday revealed that the party believes facing the election together would be in the best interest of the nation. While political peace is essential for the country, this can only be achieved if the parties are willing to work together, said Nazeer. Therefore, Adhaalath Party is ready to re-negotiate in order to formulate the most effective strategy to ensure a pro-government majority for the 19th parliament, stated Nazeer. While it is likely that the party would have to give up some of their targeted constituencies, it is also possible that there may be differences and disagreements among the members of the party due to the decision, admitted Nazeer. He urged all members to put forth the interest of the nation. Adhaalath Party is also making efforts to hold discussions with the remaining two coalition partners, Jumhooree Party and Maumoon Reform Movement in order to come to an agreement, However, no talks have been scheduled thus far. MDP highly praised Adhaalath Party on Monday, stating that AP is a strategic political party that is easy to work with. Their statement indicates that it is highly likely that MDP may form an alliance with AP for the parliamentary election. While the dispute between the coalition partners over the strategy to face the parliamentary polls have escalated, MDP had previously decided to contest for 86 constituencies while Jumhooree Party has now announced they will be fielding candidates for all desired constituencies. Adhaalath Party was the only party sticking to the original agreement, while MRM has already endorsed over 32 candidates. With this recent development, it is very likely that MDP may also give up some seats in order to accommodate Adhaalath Party's request. It s rumored that MDP is willing to give up three constituencies for AP, after considering the constituencies where AP's popularity is highest.